The first volume of this text was published in 1961, only a few months after the invention of the laser. This event triggered a wealth of developments, many of which were reported in the 240 review articles which were published in this series since its inception. 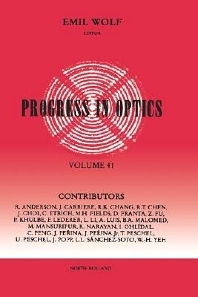 The present volume contains seven articles covering a wide range of subjects. The first article presents a review of various optical effects in spherical and circular micro-cavities capable of supporting high-Q resonant modes (commonly referred to as morphology-dependent resonances (MDRs) or whispering gallery modes (WGMs)). The second presents a comprehensive review of the theory and practice of optical disk data storage. Other articles include discussions on delay control systems for wideband phased array antennas, and quantum statistical properties of optical beams interacting in nonlinear couplers.